This contribution, like those immediately preceding it, is written in the aftermath of the 23rd June 2016 referendum on the UK continued membership of the EU. It first considers, by comparison, ramifications of Britain’s impending exit, should it occur, on the status and rights of EU27 citizens resident in the UK. It proceeds to discuss the impact of Brexit on UK citizens resident in the EU27, highlighting their predicament and appraising three potential remedies: naturalisation in another EU member state, decoupling of Union citizenship rights from Union citizenship, and modifications of the status and rights of Third Country Nationals. This contribution, like those immediately preceding it, is written in the aftermath of the 23rd June 2016 referendum on the UK continued membership of the EU. At the time of writing, there are precious few known knowns (‘Brexit means Brexit’), critical known unknowns (notably, the nature of future relations between the UK and the EU-27 and ensuing free movement arrangements), and doubtlessly many unknown unknowns. Nevertheless, the premise for this contribution will be that, following negotiations (pursuant to Article 50 of the Treaty on European Union)1 the UK will cease to be a member of the EU, and the EU treaties will cease to apply to it on exit day (E-day). Before turning to the legal predicament of UK citizens, and its potential remedies, it would be helpful to consider the effect on the estimated 3.1 million citizens of the EU-27, resident in the UK (unofficial data: Migration Observatory)2. The status of citizens of other EU Member States qua EU citizens will not be affected by the UK’s departure. Their ability to continue to exercise their acquired rights in post-Brexit UK would largely depends on decisions which can be made by the UK Parliament irrespective of the outcome of negotiations with the EU-27. Hence, the UK could ‘take back control’ over (future) immigration and nevertheless maintain, mutatis mutandis, the arrangements in the Immigration (European Economic Area) Regulations 20063 which implement the Citizens Directive.4 Nevertheless, while the UK government (July 2016 statement)5 ‘fully expects’ that the legal status of EU-27 citizens ‘will be properly protected’, it refuses to give assurances before the commencement of the withdrawal negotiations. At the time of writing, parliamentary initiatives (Early Day motion 2596, EU Citizens Resident in the UK (Right to Stay) Bill7, and a Rights of EU Nationals motion8) as well as public campaigning (see here9) have not yet come to fruition (but one remains hopeful). Similarly, there is nothing preventing the UK from continuing to enfranchise EU-27 citizens in local government elections (pursuant to section 2 of the Representation of the People Act 198310) even when it is no longer bound to do so in order to implement its treaty obligations. Notably, the UK has broadly interpreted the phrase ‘municipal elections’ in Article 20(2)(b) of the Treaty on the Functioning of the European Union11 so that EU-27 citizens can currently vote in elections for devolved administrations (Scottish Parliament, Welsh Assembly, Northern Ireland Assembly), for the London Assembly, and for mayors (where they are directly elected). Most notably, EU-27 citizens, resident in Scotland, were enfranchised in the 2014 Scottish independence referendum (see EUDO forum discussion12). In contradistinction, their right to ‘participate in the democratic life of the Union’ (Article 10(3) of the Treaty on European Union13) is inevitably going to be affected, as the UK will no longer send MEPs to the European Parliament whom they could elect. Nevertheless, citizens of the EU-27 need not thereby fully lose their right to vote for MEPs. A 2015 European Parliament report14 notes that 22 Member States of the EU-27 allow their citizens to vote for the European Parliament when they reside in a non-EU state. There are sound reasons for the EU institutions to pressure the remaining five to change their policy, especially in light of the Court of Justice’s Zambrano15 ratio that Member States should not hinder  ‘the genuine enjoyment of the substance of rights conferred by virtue of their status as citizens of the Union’. Moreover, it is not implausible that the Court of Justice’s Delvigne16 ratio (concerning disenfranchisement of prisoners, discussed here17) will prompt a legal challenge to disenfranchisement of Union citizens residing in non-EU Member States. In addition to the legal framework, it is submitted that the policy reasons for enfranchisement apply a fortiori when Member State citizens reside in a former EU Member State. Under the current treaty arrangements, all UK citizens who do not hold the citizenship of another EU Member State will cease to be citizens of the Union, whether or not they have exercised their EU mobility rights: citizenship of an EU Member State is a necessary and sufficient condition for Union citizenship (Article 9 TEU)18. Bauböck lucidly describes a ‘cleavage’ between mobile and immobile EU citizens, characterising the Brexit vote as ‘a political revolt of immobile against mobile Europeans’. But, as Oberman notes, ‘the right to immigrate’ means that today’s immobile EU citizens can choose whether to become mobile in future: indeed, while for citizens of other EU Member States, the choice may come early in life (see Paskalev’s and Sardelić’s contributions) many Britons (cue Harry Shindler19, excluded from voting in the EU referendum pursuant to the 15 year of non-residence bar20) made use of mobility rights in their later years. To borrow Joni Mitchell’s exhortation, for many Britons, the vote to leave may yet turn into a case-in-point of ‘you don’t know what you’ve got till it’s gone’. Nevertheless, as Advocate General Maduro noted in his opinion in Rottmann23  ‘Union citizenship assumes nationality of a Member State but it is also a legal and political concept independent of that of nationality. Nationality of a Member State not only provides access to enjoyment of the rights conferred by Community law; it also makes us citizens of the Union. European citizenship is more than a body of rights which, in themselves, could be granted even to those who do not possess it.’ Coupled with the Zambrano ratio (above), the question is: how can the predicament arising from UK citizens’ loss of EU citizenship status and rights be addressed? Politicians in Germany24 and Italy25 were reported to have suggested naturalisation of ‘young’ Britons residing in their respective states, and many Britons have (individually) started searching for a nationality link, most notably to Ireland26. Now, it is within the gift of Member States to determine their naturalisation criteria, and requires no treaty change; the UK tolerates acquisition of other nationalities. However, notwithstanding their well-intentioned premises, such proposals pose substantive challenges: First, they will inevitably lead to divergent treatment of UK citizens across the Union, as some states will not relax their naturalisation requirements to accommodate UK citizens. Second, relaxation of naturalisation requirements (which may include citizenship tests) on an ad hoc basis for one national group may be deemed unjustified. In this context, it is noteworthy that the Union generally encourages states that do not permit dual nationality to relax their objections in relation to the acquisition of the nationality of another Member State (Germany, for instance, generally requires its nationals to obtain permission before acquiring another nationality, save in the case of another EU Member State or Switzerland). In contradistinction, the Maltese ‘citizenship for sale’ (see EUDO debate27) caused a degree of discomfort; hence, doubts could be raised as to the propriety of e.g. en masse waver of residence requirements for naturalisation. Third, naturalisation is an inexact remedy: Britons have an effective nationality, albeit one whose instrumental value for free movement will have (potentially, depending on the UK-EU future relations) been adversely affected. Morgan’s proposition to create ‘a form of Union citizenship unmediated by any prior national citizenship’ appears to offer a more direct link between the predicament (loss of EU citizenship rights) and the remedy. However, by making the offer ‘conditional on Britain offering current EU citizens full national citizenship in Britain’ or ‘contingent on certain forms of equitable treatment for current EU citizens resident in Britain’, and by making the re-attainment (viz. retention) of EU citizenship financially contingent (€10,000) so as to ‘discourage countries from thinking that they can secede from Europe while enjoying the full benefits of membership’, he significantly weakens the normative basis of his proposition. If the Union ought to be concerned about the individual loss of EU citizenship status and rights, why should its retention be made contingent on policy choices of a former Member States? This seems like the UK government’s ‘bargaining chips’ or ‘cards’ strategy28 in reverse (it is also noteworthy, for the reasons noted above, that the predicament of EU-27 citizens residing in the UK does not arise from an ineffective nationality). Moreover, it is not only morally contestable, but also puzzling how making the re-attainment of Union citizenship costly for individuals will discourage states from ‘seceding’ (withdrawing) from the Union: it seems plausible to assume that (most if not all of) those UK citizens who would wish to retain their Union citizenship had preferred that the UK remain in the Union, but were outvoted. If the Union is concerned about preservation of their individual status and rights, it is due to the disjuncture between their own preferences and the aggregate preferences of their polity. Finally, it is rather unclear whether Morgan proposes to open the Union citizenship route to all UK citizens who do not hold the citizenship of another EU Member State, or just to those who have already exercised mobility rights. Dawson and Augenstein argued elsewhere29 that the decision to withdraw Union citizenship (viz. obtaining Union citizenship through citizenship of a Member State) should rest not with the withdrawing state but with the individual EU citizen, who may either retain or renounce his or her citizenship. This proposition appears more comprehensive and normatively consistent: it would apply to all Britons (whether or not they have exercised mobility rights), recognising their unique predicament as citizens of a former Member State, and thus distinguishing them from citizens of other states, for whom the route to Union citizenship will remain via acquisition of Member State citizenship. It also does not tie their fate to that of the EU-27 citizens. Indeed, there is arguably a qualitative difference (for individuals) between exclusion from club membership and benefits, on the one hand, and non-inclusion therein, on the other hand: many organisations (think universities) retain a special relationship with their alumni. However, the decoupling of Union citizenship from citizenship of a Member State would require a fundamental treaty change. What will the creation of two categories of Union citizens do to the self-perception of the EU as an ‘[ever closer] union among the peoples of Europe’ (Article 1 TEU30), a ‘demoicracy’ a-la Nicolaïdis31? To draw on the university alumni analogy, their privileged status (compared with members of the public) is manifested by retention of access to entitlements generally restricted to members – but they are nonetheless former members. Absent treaty change that will address the predicament of UK citizens qua former Union citizens, UK citizens who do not hold the citizenship of another Member State on E-day will become Third Country Nationals (TCN). Mobile UK citizens may qualify as Long Term Residents (LTR). As such, they will benefit from the LTR Directive32 (as amended33 in 2011 to extend its scope to beneficiaries of international protection) and from the Right to Family Unification Directive34. Both Directives apply in all EU-27 Member States except Ireland (where UK citizens have a free-standing right to reside that preceded Union membership) and Denmark. Pertinently for this debate, after five years of continuous residence (Article 4 LTRD) and subject to satisfying additional criteria, LTRs acquire the right to reside in the territory of Member States other than the one which granted them the long-term residence status (Article 14(1) LTRD); following the acquisition of LTR status, they enjoy substantive entitlements under EU law wherever the reside in the Union, including equality of treatment with Union citizens in a wide range of economic and social matters (Article 11 LTRD) and enhanced protection against expulsion (Article 12 LTRD). A fairly modest legislative change to the LTRD that would mitigate the predicament of UK citizens could be the granting of LTR status to mobile UK citizens, irrespective of whether they have met the continuous residence and/or other LTRD requirements. One of the substantive differences between mobile EU citizens and TCNs concerns political participation. TCNs are not entitled to participate in the ‘democratic life of the Union’; nor are Member States required to enfranchise them in local elections. However, nothing prevents Member States from so doing: indeed, the (limited35) number of signatories to the Council of Europe Convention on the Participation of Foreigners in Public Life at Local Level36 are committed to residence-based enfranchisement on the local level and among the EU-27, eleven states permit TCNs to vote in local elections. The Union could amend the LTR by disaggregating certain citizenship rights, such as national treatment in respect of local voting rights, from Union citizenship. The Brexit vote came about, in part, due to anxieties surrounding the (perceived) absence of suitable controls on the exercise of the right to free movement by Union citizens. To borrow an earthquake metaphor, the extent to which the aftershocks of 23rd June 2016 will rupture the Union’s legal terrain remains to be seen. The Lisbon Treaty, available at http://www.lisbon-treaty.org/wcm/the-lisbon-treaty/treaty-on-European-union-and-comments/title-6-final-provisions/137-article-50.html. The Migration Observatory at the University of Oxford (2016), Commentary: Here today, gone tomorrow? The status of EU citizens already living in the UK, available at http://www.migrationobservatory.ox.ac.uk/resources/commentaries/today-gone-tomorrow-status-eu-citizens-already-living-uk/. ‘Government can “unilaterally” grant EU citizens right to remain after Brexit’, The Guardian, 18 October 2016, available at https://www.theguardian.com/politics/2016/oct/18/government-unilateral-eu-citizens-right-to-remain-brexit-roger-casale-nicolas-hatton. Ziegler, R., J. Shaw & R. Bauböck (eds.) 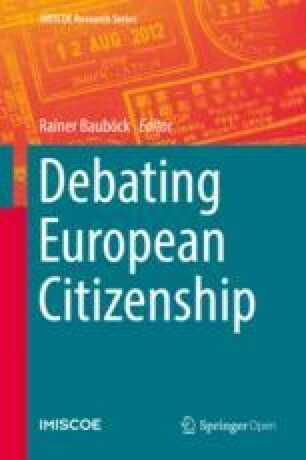 (2014), ‘Independence Referendums: Who Should Vote and Who Should be Offered Citizenship’, Robert Schuman Centre for Advanced Studies, EUDO Citizenship Observatory Working Paper 2014/90, available at ?http://cadmus.eui.eu/bitstream/handle/1814/32516/RSCAS_2014_90.pdf. Judgment of the Court (Grand Chamber) of 8 March 2011, available at http://eur-lex.europa.eu/legal-content/EN/TXT/?uri=CELEX%3A62009CJ0034. Ziegler, R. (2016), ‘The “Brexit” Referendum: We Need to Talk about the (General Election) Franchise’, Verfassungsblog On Matters Constitutional, available at https://verfassungsblog.de/the-brexit-referendum-we-need-to-talk-about-the-general-election-franchise/. Ziegler, R. (2016), ‘The referendum of the UK’s EU membership: No legal salve for its disenfranchised non-resident citizens’, Verfassungsblog On Matters Constitutional, available at http://verfassungsblog.de/the-referendum-of-the-uks-eu-membership-no-legal-salve-for-its-disenfranchised-non-resident-citizens/. ‘German politicians propose offering young Britons dual citizenship’, The Guardian, 3 July 2016, available at https://www.theguardian.com/world/2016/jul/03/german-politicians-propose-offering-young-britons-dual-citizenship. ‘Italy’s Renzi suggests “ad hoc” citizenship for young Britons abroad’, EBL News, 29 June 2016, available at https://eblnews.com//news/europe/italys-renzi-suggests-ad-hoc-citizenship-young-britons-abroad-27245. Shachar, A. & R. Bauböck (eds.) (2014), ‘Should Citizenship be for Sale?’, Robert Schuman Centre for Advanced Studies EUDO Citizenship Observatory Working Paper 2014/01, Florence: European University Institute, available at http://cadmus.eui.eu/bitstream/handle/1814/29318/RSCAS_2014_01.pdf?sequence=1. ‘Liam Fox: EU nationals in UK one of “main cards” in Brexit negotiations’, The Guardian, 4 October 2016, available at https://www.theguardian.com/politics/2016/oct/04/liam-fox-refuses-to-guarantee-right-of-eu-citizens-to-remain-in-uk. Dawson, M. & D. Augenstein (2016), ‘After Brexit: Time for a further Decoupling of European and National Citizenship?’, Verfassungsblog On Matters Constitutional, available at http://verfassungsblog.de/brexit-decoupling-european-national-citizenship/. Consolidated Version of the Treaty of the European Union, available at http://eur-lex.europa.eu/LexUriServ/LexUriServ.do?uri=OJ:C:2008:115:0013:0045:en:PDF. Nicolaïdis, K. (2012), ‘The Idea of European Demoicracy,’ in J. Dickson & P. Eleftheriadis (eds. ), Philosophical Foundations of European Union Law, 247-274. Oxford: Oxford University Press, available online http://kalypsonicolaidis.com/wp-content/uploads/2015/02/2013_TheIdeaofDemoicracy.pdf. Council Directive 2003/109/EC of 25 November 2003 concerning the status of third-country nationals who are long-term residents, available at http://eur-lex.europa.eu/legal-content/en/ALL/?uri=CELEX:32003L0109. Council Directive 2003/86/EC of 22 September 2003 on the right to family reunification, available at http://eur-lex.europa.eu/LexUriServ/LexUriServ.do?uri=OJ:L:2003:251:0012:0018:en:PDF. Chart of signatures and ratifications of Treaty 144, available at https://www.coe.int/en/web/conventions/full-list/-/conventions/treaty/144/signatures?p_auth=0ZKv2OhD. Convention on the Participation of Foreigners in Public Life at Local Level, available at https://www.coe.int/en/web/conventions/full-list/-/conventions/rms/090000168007bd26.